I absolutely love my new coverlet. It is the perfect weight and the colors are perfect. Very tranquil in our new room. I only wish I could decide on a color for our bed skirt. It is very good quality and it had no dye smell and it is the perfect length for our California king bed. Would definitely recommend this product. 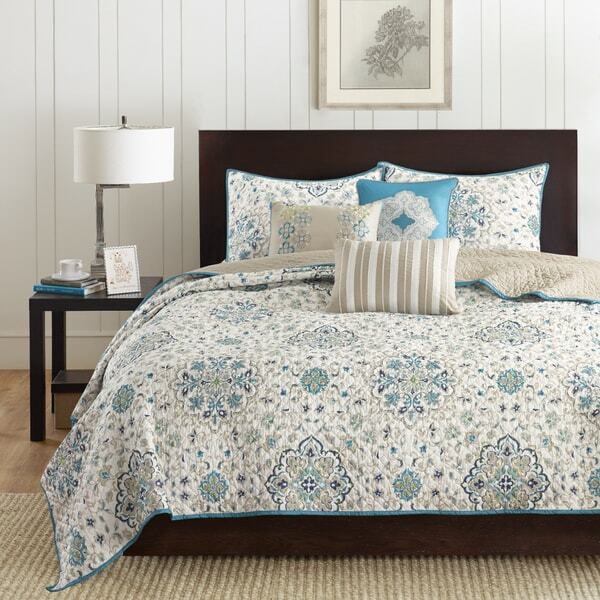 Update your bedroom with a fresh new look in the Madison Park Maya Coverlet Collection. These neutral colors and pop of teal are printed on polyester microfiber for a soft hand feel on the face and the reverse is a solid ivory brushed polyester fabrication. Three decorative pillows feature embroidery and piecing details to add dimension and a pop of detail to the top of bed. Not worth it! I sent it back three times and every set had the same problem. They weren't sewn properly, like a quilt. All the layers of fabric were just sewn together with the trim fabric. You could pull the pattern fabric up from the beige fabric with all the stuffing lose in between. The picture shows it sewn together like a quilt. Really weird why the layers of fabric weren't sewn together. Overstock on all three occasions was supposed to have someone inspect the quilt set before mailing it but no one every did that so I ended up with three bad sets. The quality is also lacking. The quilt is not very thick. The only good thing I can say is the quilt set does look just like the picture. Love the color and the matching pillows. Already mention it to friends. Oh my goodness I love love love my new coverlet set it is true to the color and it makes my bedroom look so fresh and cozy! I recommend anyone looking for a new style or fresh look go online to overstock! The product came earlier and packaging was neat and clean! Teal color is bright just as pictured. Love it. Just enough to give it some pop! My walls are a dark tan color. The tan in the coverlet is perfect. This is in my guest room. White furniture. Looks great. Yes. I would certainly recommend to a friend. I really liked the weight and color of this coverlet, but there was a large section in the middle that was not quilted and I had to return the set. Beautiful and very soft coverlet. I adore it! This set is so beautiful. It's soft and the material is awesome. I purchased a king size and it's perfect. Very well made. I couldn't ask for anything more. I bought this for a spare bedroom that my teenage granddaughter will use occasionally. It's so pretty. I am using teal and beige. Love the colors. I'll be using the same color teal for curtains, and a teal rug. Nice colors and nice quality product. Friends who've seen it seem to love it! Great size, good quality, heavy weight. Stands up to a kitten trying to climb up it to snuggle under it!! The color and pattern were true to the pictures. I’m very happy with this purchase. The price was outstanding! "It lists this as real but the picture looks blue. Can someone help?"